Consumers in the UK continue to have a voracious appetite for digital video content. But while they’re watching more content across more platforms and channels, it’s still difficult for advertisers to keep up. The UK is a mature digital video market, with digital video viewing one of the most common digital activities. Slow growth will continue, with impetus coming from the youngest and oldest age groups. Mobile viewing is increasing at the expense of desktop/laptop viewing, but smart TVs are also seeing robust growth in usage. This demonstrates the continuing appetite for long-form content viewing on the big screen. There’s a fairly clear correlation between device choice and content type, with mobile taking up most of the short-form viewing share and larger screens accounting for greater proportions of long-form content viewing. YouTube dominates shorter video, but in the long-form arena, platform providers are borrowing the best elements of each other’s service to appeal to an already well-served audience. For advertisers, subscription video services are largely ad-free and thus off-limits, while ad-supported services are tricky to monetize, with a discerning audience used to relatively unobtrusive TV advertising. The greatest levels of engagement with video ads are being seen on social media channels via mobile devices. 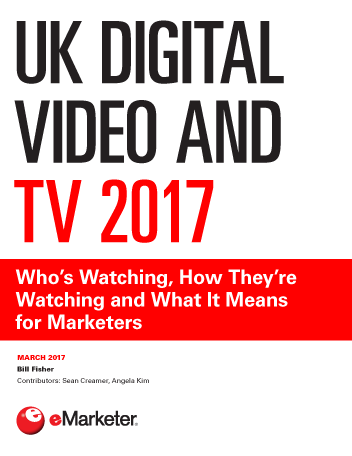 "There will be more digital video viewers than smartphone users in the UK in 2017, hinting at a very mature digital video marketplace."